The third architectural history and photography tour took place last Sunday, 19 June ’11, in Carol Park area of south central Bucharest. The park hosted in 1906 the great National Royal Exhibition, held to celebrate King Carol I’s jubilee of 40 years of glorious reign, during which he modernised and Europeanised the country, won its independence from the Ottoman Empire on the battlefield and extended its territory to the shores of the Black Sea. The exhibition has also been intended as a showcase for the new national architectural style, known today as Neo-Romanian. Anyone intending to properly understand this architectural order, needs to study the designs used for the buildings making up that exhibition, the problem being that nowadays, more than one century later, there are just a few surviving remnants of those edifices and artistic creations. I aimed in my tour to chart and mentally reconstruct as much as possible from the old Royal Exhibition, and I believe that I was quite successful in that endeavour, judging from the feedback received from some of the participants. We viewed, for example, a reinforced concrete bridge, a technical rarity for that era, adorned with Neo-Romanian motifs or admired a great sculptural assembly in the Neo-Romanian style. Apart from the park, we visited the surrounding area, where the local architecture was visible influenced by the archetypes showcased at the exhibition. A highlight of the tour was Filaret train station, the first railway terminus of Bucharest, dating from 1869, about which I wrote an article yesterday, click the link here for access. The photomontage above presents some of the interesting buildings from different historical eras encountered during the tour and bellow is a selection of photographs with the wonderful tour participants, together with a slide show encompassing those images. I trust that the participants had a beautiful day out, shot attractive architectural photographs and enhanced their knowledge about the remarkable architectural history of this corner of Bucharest! 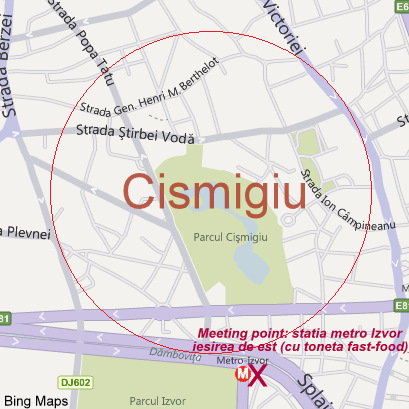 The next Sunday (26 June ’11, 9am-12.00) architectural history and photography tour will take place in Cismigiu historic quarter, west central Bucharest (see a map at this link); meeting point: Izvor tube station (outside eastern exit, toward the fast food restaurant). I look forward to seeing you there!